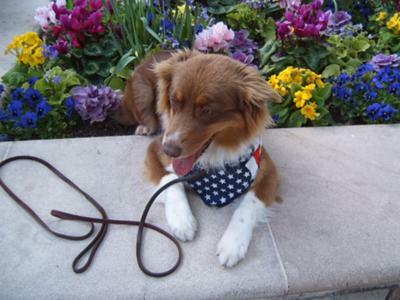 Hi my name is Cinder, I am a red tri Australian Shepherd. I live in California, with my family and my brother, Makcay, who is a black toy poodle. Mackay house-trained me and taught me everything he knows , so I got off to a great start. We like to romp and play together everyday. When I was 3 months old I started puppy obedience classes. I am an advance novice now that I am 3 yrs old. I also received my CGC and I am working to get my TDI. I want to go to schools and read with small children. My mom is a retired teacher and she thinks we will make a great team helping children to read. I love to go on walks, and especially like to go shopping with mom to Santana Row, in San Jose, Ca. Santana Row is dog friendly and I even get to go in the stores and restaurants. I am looking forward to start my TDI classes. I love to travel with my family especially to Idaho Falls. It is a beautiful state with lots of room for me to run and play. My cousin, Toby lives there in the country, he is a black standard Schnauzer. He loves to swim in the canal when he gets hot just to cool off. I was born in Neuvo, Ca. My dad, Tristan is a champion and he is a blue merle. My mom, Ever is a red tri Aussie just like me. I have a wonderful happy life with my family and we have a very close bond together, especially mom. I wish all the dogs everywhere had a wonderful home like mine. Life is Great.